Cool Tools for : Join Our ThingLink 360/VR Bootcamp Celebration Event! -->Sign up to attend live on 3/20/17 @ 7:00 pm EST OR to access the archived recording. 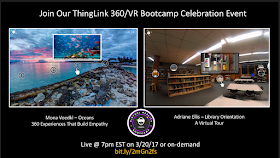 We encourage all of the amazing ThingLink Bootcamp Grads to share their featured 360/VR image during an upcoming webinar. We recognise that our fabulous Bootcamp Grads are among the busiest educators on the planet, and we hope the opportunity to share is a motivating factor that can help bring your work to the next level! Bootcamp grads are encouraged to set a goal and share during our informal, quick, and fabulous webinars. There's nothing better than listening to a Bootcamp grad explain the interactive image created!